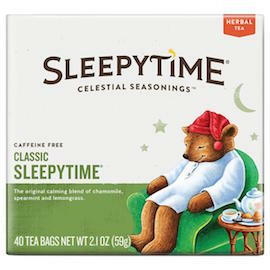 Sleepytime's comforting aroma and perfectly balanced flavor are achieved by blending soothing herbal ingredients from around the world - including floral Egyptian chamomile, cool spearmint from the Pacific Northwest and lively Guatemalan lemongrass. This global synergy is only fitting since all over the world generations of tea lovers have wound down their day with Sleepytime. Ingredients: Chamomile flowers, spearmint leaves, lemon grass, tilia flowers, blackberry leaves, orange blossoms, hawthorn berries, and rosebuds.